I am signing off for the weekend but before I go I wish you all a wonderful time with your friends and family. It's my last weekend in India and I'll try to make the most of it. My heart hurts with the thought of leaving my home, my family and friends behind, again. But I cheer myself up with the hope that I'll soon be coming back to everything I cherish and am proud of. This weekend is going to be a busy one and I am nervous about the coming week. I have the whole house to pack, thank God I have friends who have taken a couple days off to give a hand with the packing. Thanks for listening. It feels great to know that you are there with me everyday. 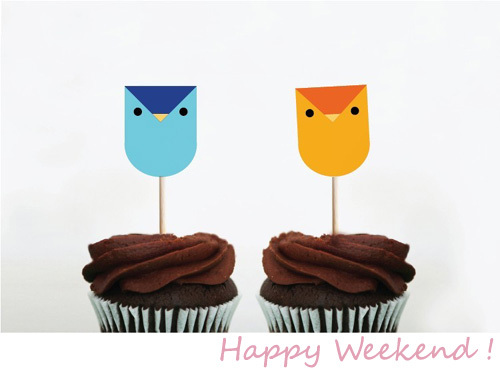 Take care of yourself and have a great weekend! 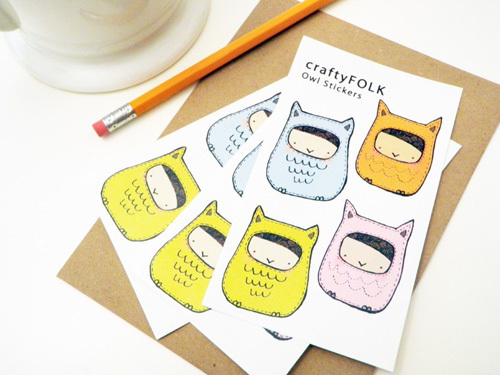 Sarah of craftyFOLK is giving away a set of 12 of these darling owl stickers to anyone who follows these steps (that means I'll get one too! Yay!). 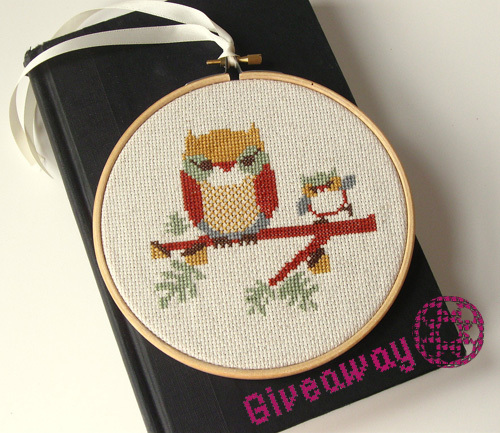 Slipcover Your Life’s Stitchery Giveaway! Erin Stanton of Slipover Your Life is celebrating the opening of her new Etsy store -Slipcover Your Life’s Stitchery by hosting five giveaways on different blogs. Each giveaway will run for the full week. Today, I am thrilled to announce that Erin has offered this lovely Owl and Owlet as a giveaway for My Owl Barn's readers. The winner can choose between a finished art piece and a kit (the kits includes the aida cloth, embroidery floss, embroidery needle, wooden hoop and original pattern). Winner will be announced sometime on April 9th! Update: Susy is our winner! Thanks for participating. 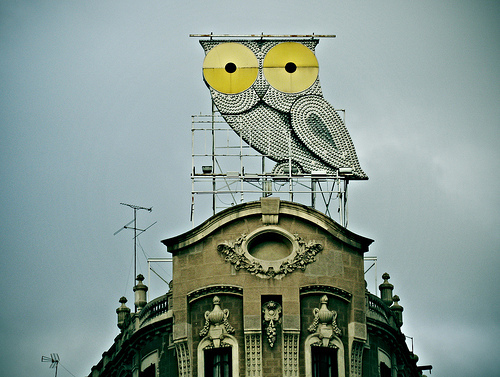 This owl structure can still be found on the roof top of the Rotulos Roura Company building in Barcelona. It was an advert for a neon lighting company and used to be illuminated, but not any more. I find this image striking and the photographer has done an amazing job in capturing the great colors. 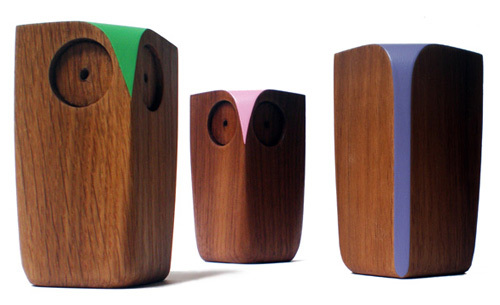 Let's start our day with these adorable wooden owls by Matt Pugh. His products are simple and contemporary in design with just the right amount of colors. 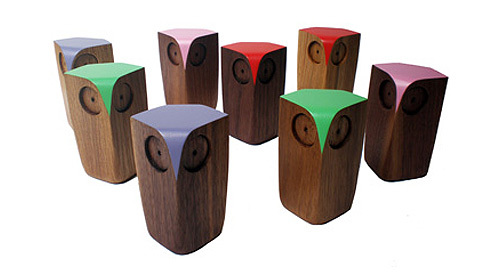 These owls are available in oak and walnut wood in many colors. I really love Leah Duncan's work and was thrilled to see her products shots from the recent photo shoot with Paige Newton, here. The outdoor setting is stunning, and I think the surrounding blends perfectly with the colors of Leah's products. Leah is currently working with ceramics and planning to work with Paige in the future. Stop by her store, if you wish to shop for her tea towel, stationery and prints. 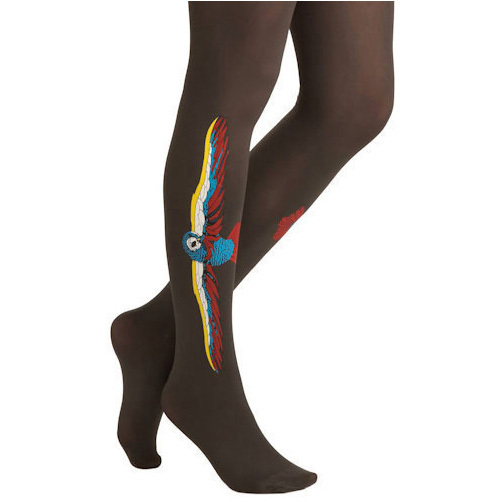 If your are not ready to go without tights and a sweater, yet, then I am sure you would too like these owl screen printed tights. 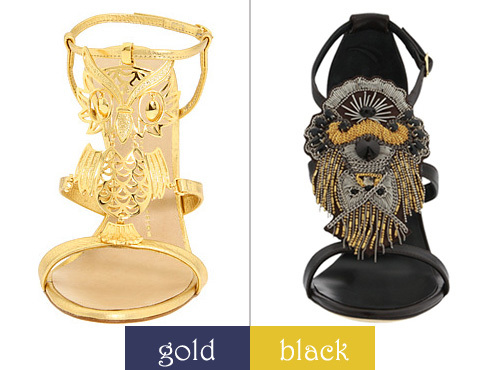 Giuseppe Zanotti is a celebrated Italian shoe designer whose collection has something for everybody. Even for owl lovers! I was browsing through his collection online and came across not one but two owl designs. Yay! His creations are true to his initial inspirations, where art and music are essential feelings to be turned into style for our feet… feet that Zanotti does not want to cover with models, but rather to adorn out of regard for a woman’s beauty and for the world revolving around her. 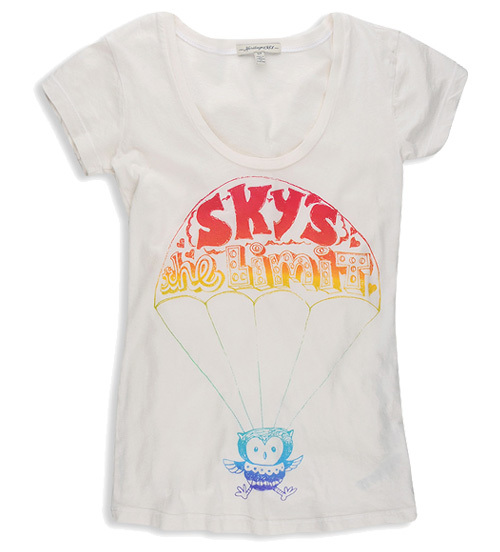 'Sky is the limit' tee by Forever 21. 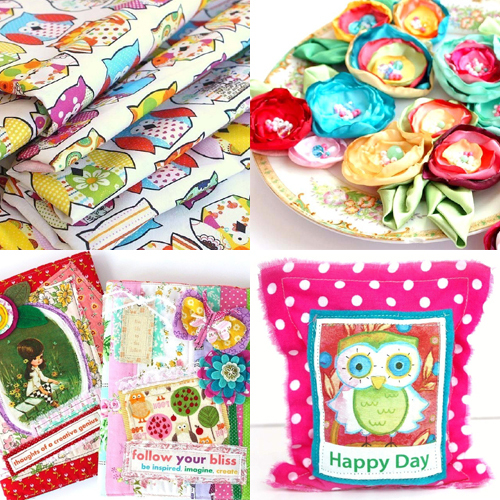 Lemon Tree Studio is a lovely store of a stay at home mom who loves to create with fabric. Some of her sweet creations are clutches, fabric tags, brooches, dresses, buttons and pillows. 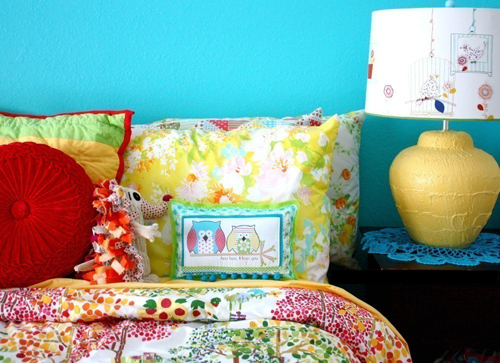 Take a peek into her colorful world at her blog. Hello! I hope you had a great long weekend. Did you dye Easter eggs and eat candy? 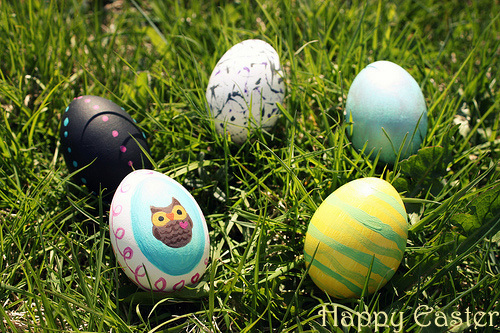 And, if you are still holding on to those empty plastic candy eggs then this post is for you. 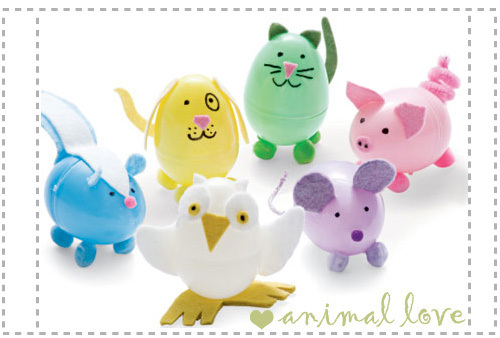 Today's craft project comes with easy instructions on transforming the plastic eggs into these adorable animals. It seems like a fun project to be enjoyed with your little one. For template and instructions click here. I thought I'd pop in to wish you all a Happy Easter!